UConn researchers are developing an immersive learning experience using virtual reality (VR) and game design to bring to life archival materials from the Nuremberg Trials. With the help of a $25,000 Digital Projects for the Public award from the National Endowment for the Humanities (NEH), researchers from UConn’s Digital Media and Design Department in the School of Fine Arts, UConn Library’s Archives & Special Collections (ASC), and Neag School of Education are working with colleagues across the globe to make this project a reality. 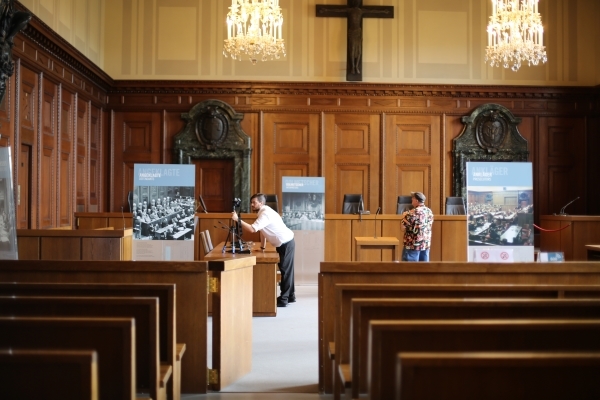 The team hopes that their Courtroom 600 project – named for the courtroom in the Justizpalast in Nuremberg, Germany, where the trials took place – will draw learners into ongoing thought and empathetic discussion about human rights both past and present. The goal of Courtroom 600 is to engage learners in historical thinking processes as they explore international justice and Holocaust histories through the lens of the major war criminals trials that took place in Nuremberg, before the International Military Tribunal (IMT) in 1945-1946. Although the trials were held more than 70 years ago, their impact is still evident in modern international law. Legacies of the IMT include the development of international criminal courts, the Universal Declaration of Human Rights, the Convention on the Prevention and Punishment of the Crime of Genocide, and the “Nuremberg Code” of medical and scientific ethics. The research and advisory team, which includes experts in educational psychology, digital public humanities, human rights, international law, and Holocaust history, considers teaching learners how to evaluate the nature of evidence as a critical first step in understanding the histories and legacies of the Holocaust and the IMT. Among other aims, the Courtroom 600 VR experience will also write women’s roles and Jewish resistance back into Holocaust history. While the project seeks to help users have a personal encounter with an important event from Holocaust history, the technology behind the project couldn’t be more futuristic. The team has completed a technological proof-of-concept, with software code that connects the UConn Library’s digital repository to various systems used for educational VR experiences. Embodying a fictitious member of the U.S. prosecutorial team, learners must investigate digitized copies of documents, photographs, and other primary source materials. Then, aided by materials that provide historical context, they piece together an understanding of past events and accumulate evidence against selected defendants. When finished with the discovery phase of the investigation, the Courtroom 600 experience places learners in a three-dimensional, human-scale reproduction of Courtroom 600. Here they listen to testimony, interrogate witnesses and defendants, and consult with the prosecuting attorneys on their team about strategy – in other words, learners actively experience the trials instead of passively hearing about them. The archival materials used for the virtual experience are pulled in real time from executive trial counsel Thomas J. Dodd’s papers housed at UConn Library’s Archives and Special Collections in Storrs. Through one of the first collaborative projects of its kind in the nation, UConn and partner organizations digitized 50,000 depositions, photographs, pieces of evidence, correspondence, drafts of legal briefs, and other documents from the Nuremberg Trials for use by scholars and now the public. Thanks to the recently awarded NEH funding, members of the Courtroom 600 project and a panel of national and international experts will meet in Storrs for a two-day charrette in June 2019. Project collaborators include specialists from the United States Holocaust Memorial Museum in Washington, DC, and the Memorium Nürnberger Prozesse (Nuremberg Trials Memorial) in Germany. They will have the opportunity to don VR headsets, take up the controls, and spend time experiencing the prototype for themselves. In addition to gathering information on possible approaches to the narrative, learning objectives, and visual treatments in focus groups, the software will capture data about user interactions to refine the prototype. The June meeting will also involve discussions of what it means to present Holocaust history through this new medium. The NEH funding will bring the project closer to completing a prototype of the first educational module of the Courtroom 600 experience. The team will test the module at UConn and with collaborating museums dedicated to Holocaust and human rights histories. This project is made possible thanks to generous support from a University of Connecticut School of Fine Arts Dean’s Grant, the Thomas J. Dodd Research Center, and the UConn Office of Global Affairs. Cultural exchange and cooperation between the University of Connecticut, Germany, and Israel have also been critical to the project’s early success. The UConn project team includes: PI Ken Thompson, co-PIs Clarissa Ceglio, Stephen T. Slota, and Greg Colati, with advisors Heather Elliott-Famularo, Charles B. Lansing, Alan Marcus, Glenn Mitoma, Grae Sibelman, Graham Stinnett, and Daniel Weiner.